Pope Francis on May 14, 2018, spoke in simple terms of Jesus and Friendship in his homily at Mass in Casa Santa Marta in the Vatican. As reported in Vatican News, he reminded the congregation that friendship with Jesus isn’t by chance but is the Christian’s destiny. Today is the Feast of Saint Matthias, who was chosen “by lot” by the disciples to replace Judas Iscariot, who betrayed Jesus. Matthias was chosen from a small group who had been followers since the early days of Christ’s ministry. For the rest of us, Jesus offers his friendship not “by lot” but as a gift. And he continues His offer even when we betray Him “with our sins, with our whims” and “faithful to His friendship”. The Holy Father affirmed that all Christians receive this friendship, although the disciples received in in “stronger” measure. The Pope referred to the gospel reading for the day (JN 15:9-17) in which Jesus tells the disciples that they are not slaves or servants, but friends. And he awaits those who avoid Him, always there with His friendship. 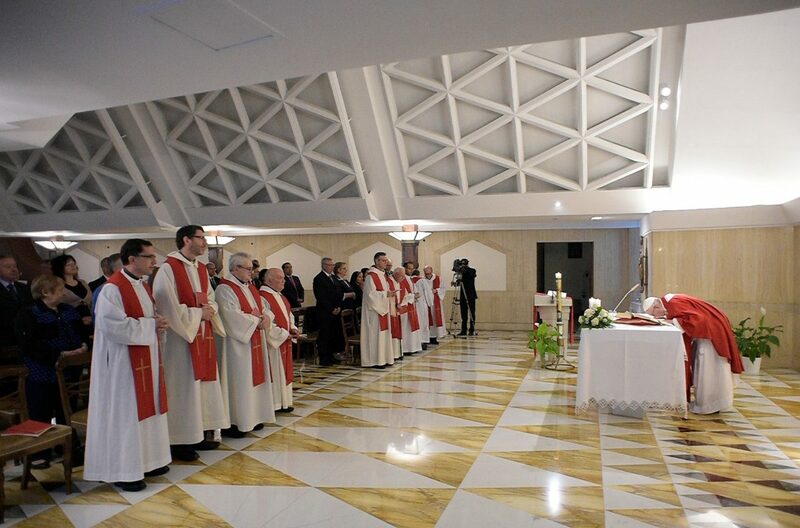 Francis concluded by urging Christians to ask Jesus for the grace to stay in His love and friendship.